The Center for Financial Inclusion (CFI) is an action-oriented think tank working with financial service providers, policy makers, regulators, technology providers, and others to realize full financial inclusion worldwide. 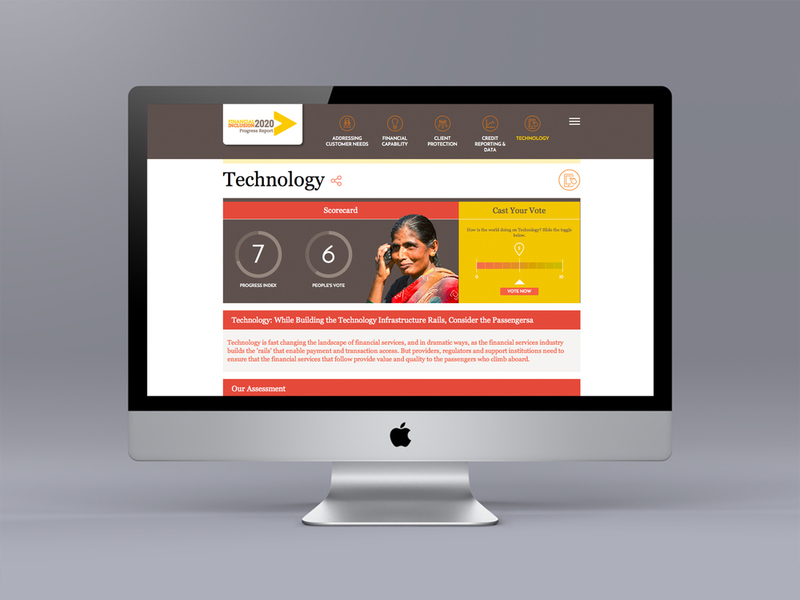 To build a movement toward full financial inclusion using the year 2020 as a focal point to galvanize action, CFI partnered with NEO to develop a truly interactive Progress Report. NEO created a best-in-class online experience providing wider and more meaningful engagement and stronger promotion of CFI and its goals. Progress in five key focus areas (Addressing Customer Needs, Financial Capability, Client Protection, Credit Reporting & Data and Technology) are highlighted with the ability to allow readers to weigh in: users can cast their vote to grade these focus areas through an integrated database function that displays the scores in real time. Unlike previous versions, which existed as PDF documents, this new report created meaningful engagement through a variety of interactive features such as real-time voting, videos, interactive maps, slideshows and podcasts. Visitors can participate by casting their vote, which is captured in the database, tallied and displayed in real time. A fully responsive experience on all mobile devices encourages greater accessibility and engagement. An integrated blog section allows readers to engage with others on timely matters that are key to achieving financial inclusion.